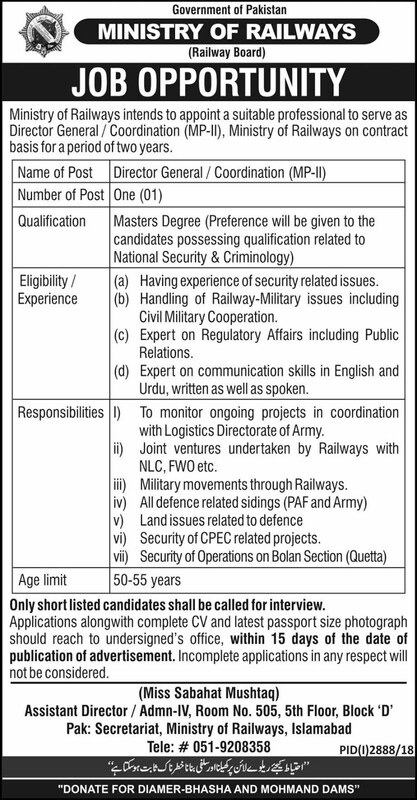 Below are the complete details of the Director General jobs in Ministry Of Railways in Islamabad. Skills Required for Job: Skills:- Listening, Speaking and writing & Analytical and Problem solving skill. ensure everybody knows their role. set clear goals and communicate them. put in place clear lines of communication. clarify lines of responsibility. Qualification: Qualification: Must have relevant of working experience in similar job role masters degree in national security & criminology additional certification in Office Management is a plus & Interested candidates send your cv before this date 12nd Jan 2019. 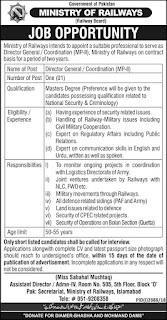 Director General jobs in Ministry Of Railways Islamabad, in Pakistan published on Paperpk.com from newspaper on December 29,2018. Job seekers who are already working as Director , Director General , Executive Director , Managing Director , Director General (Information Technology) can also apply for post of Director General.